Piqua Transfer and Storage (PTS) started in 1904 with one man, six horses, and 12 wagons, and continued this way for over a decade. 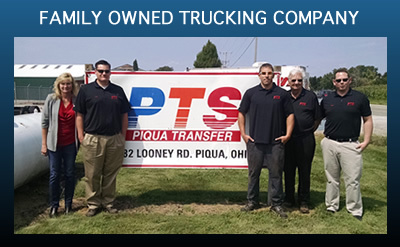 PTS is the oldest company of its kind in the city of Piqua, Ohio, a town conveniently located off of the interstate 75 corridor. Since then it has evolved into the thriving business it is today, running 64 operating units carrying a variety of goods as far west as Washington state, as far east as Maine, southwest to Arizona, and everywhere in between. PTS is an active supporter of the community in and around the city of Piqua. We are partners in the promotion of local schools and businesses at numerous events throughout the year. One of our favorite events is the Taste of the Arts festival held annually in downtown Piqua, and it is a unique and fun attraction. Our company’s long-standing tradition of community involvement and support add to our cohesive atmosphere as a local business and will continue to do so in the future.